THQ DDTs an arcade classic into the floor. During the 90s, there were a handful of 16-bit wrestling games to choose from for both Super Nintendo and Sega Genesis, including the likes of WWF Raw, WWF Royal Rumble and the whacky WWF WrestleMania: The Arcade Game, all of which failed to unseat the champ, WWF WrestleFest, an arcade smash hit from Technos. Although it only had two match types (Saturday Night's Main Event and Royal Rumble), this thrilling beat-em-up delivered brutal quarter munching action, along with plenty of WWF (now WWE) star power, from Hulk Hogan and Ultimate Warrior to The Legion of Doom and Mr. Perfect. In the end, it was a button masher, but a damn good one. 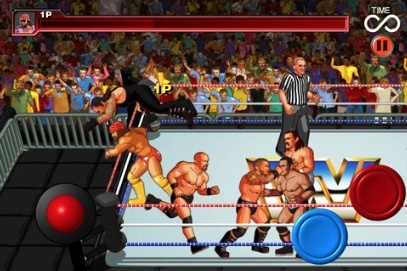 With this in mind, I was briefly ecstatic at the news of THQ reviving WrestleFest for iOS, complete with new wrestlers, venues and matches. I say briefly, because this game bears little to no resemblance to its predecessor, and even worse, is too difficult to enjoy. Yes, it's a button masher. It's also extremely unfair, as computer opponents battle back from near unconsciousness to whittle away my wrestler's health bar, or pull off a series of unbreakable maneuvers, despite rapidly hitting the buttons. Frustration quickly set in, especially with such a vague tutorial. Good luck figuring out how to tag your partner during a tag team match. 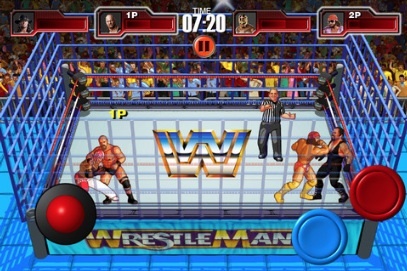 As for the roster, THQ had the nerve to provide eight wrestlers ("Macho Man" Randy Savage, Randy Orton, The Rock, Undertaker), with an additional five via in-app purchase, after charging $2.99 or $3.99 (depending on whether you want the Premium iPhone or HD iPad version) for the game. Even worse, these wrestlers appear in the Royal Rumble match, which is one big tease. There's no reason to make us pay for Big Boss Man, CM Punk, Shawn Michaels, Sheamus and Triple H while inserting these guys into different matches. Just make them available from the start. The graphics, meanwhile, are a weird mix of old and new. 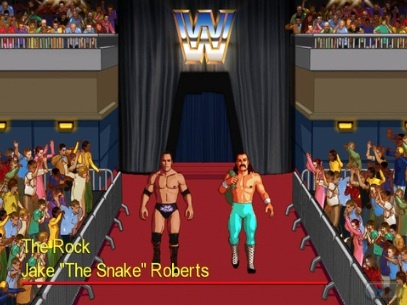 THQ chose a horrible font for the menus, and the character models bear little resemblance to the pixelated and chunky superstars from the original WrestleFest, which, strange as it may sound, is a shame. On the positive side, the game includes six modes (Exhibition, Road To WrestleMania, Royal Rumble, Saturday Night's Main Event Tournament, Tag Team and Gauntlet), so there's variety. There's also online multiplayer, though we had trouble finding opponents. On that note, WWE WrestleFest is the best wrestling game on the App Store, but that's only because there are so few to choose from. THQ had the opportunity to do something brilliant, but poorly designed A.I. ruined what could have been a sweet revival. Review code provided by THQ. What's Hot: Good but limited mix of superstars, 90s inspired arcade music. What's Not: Cheap computer opponents, little strategy to speak of, tough finding people online, HD version costs extra, in-app purchase to unlock other wrestlers.